Alicé Pasquini isn’t a stranger in Berlin but she also doesn’t visit as often as other international artist. In 2012 she visited the city and illegally ‘donated’ around 25 pieces of art mostly in the districts of Friedrichshain and Kreuzberg. 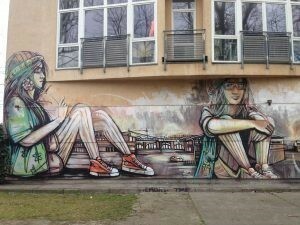 Of those 25 only about 7 still exist but as such is the existence of street art. 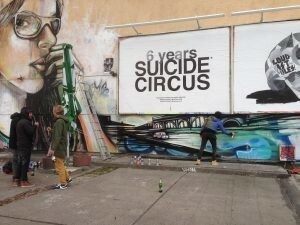 In 2014 Alicé once again visited and spent 6 days painting a wall near to the East Side Gallery. It took about 8 months before the first tag appeared on this mural. A tag from Leon that was quite respectfully placed, covering very little detail. 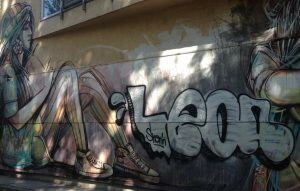 Soon after Leon’s tag the Mural was attacked by a tagger who placed 5 outlines of the same tag and finished only 1. The result was some unnecessary destruction of an otherwise beautiful mural. Eventually the unfinished tag outlines were covered with more tags including the signature fish of FUKU SHIMA. This development took several months until much of the lower half of Alicé’s mural had disappeared. In Early April Alicé returned to the mural with a rucksack full of spray paint to restore the mural to its former beauty. This was of course done legally and in broad daylight, allowing passersby the opportunity to see her talents first hand. 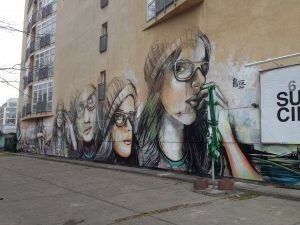 After 2 days of work the mural was fixed and with more beautiful detail this time.